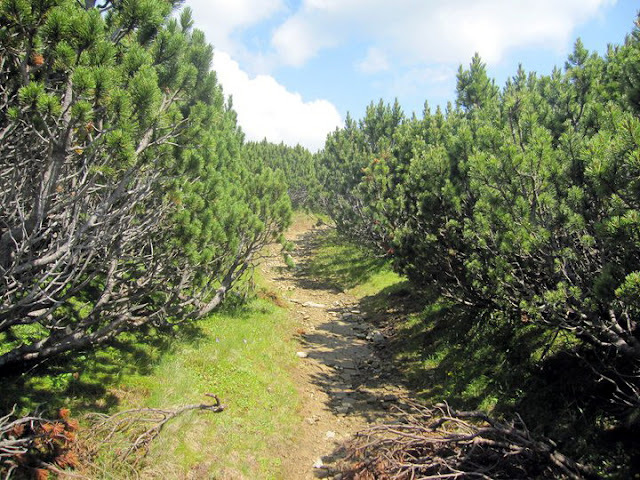 Mugo Pine aka Pinus Mugo, Mountain Pine, Pinus montana or Latschenkiefer is an atypical dwarf shrub from Pinaceea family of a pine native from the sub-alpine areas of Europe. It is very popular plant in gardens, parks and landscaping all over the world. 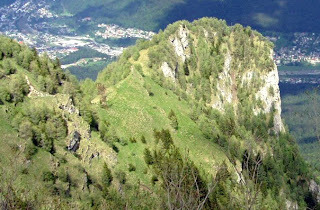 It has variable size and shape depending on the area (alpine, sub-alpine) where is growing. Typically it grows near the timber lines no more than 10 feet tall. Sometimes the large number of branches produce plants twice as wide as their height. Dwarf Mugo Pine is extremely tolerant of a diversity of planting locations, doing best in full sun or light shade, in rich / black soil or in poor / infertile soil, in high mountain meadows, rock gardens or urban bedding plants. These dwarf pines follow a variable pattern in growth rate, usually when they are planted as garden shrubs, they are growing 5-10 cm per year. 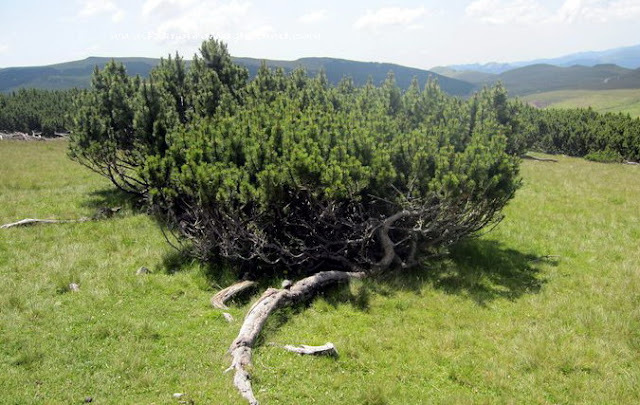 They have sharp and twisted evergreen needles 2-5 cm in length which persist up to five years. 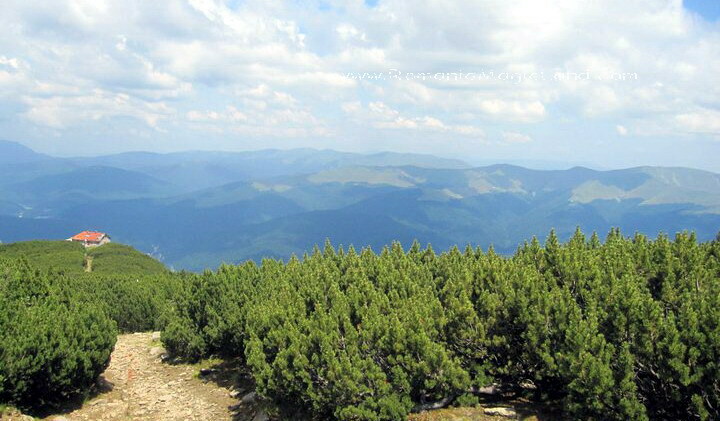 I came across the beauty of the Pinus Mugo type Mugo when I visited for first time Mugo Pine Valley / Valea Jepilor / Valea Caraiman from Bucegi Natural Park, Carpathians Mountains, Romania (with stunning landscapes like Canadian Rockies). In Romania and in many other countries, the Mountain Pine (in Romanian named Jneapan / Jnepeni) is included in the list of natural species protected by law. As a child, I learned how to harvest buds and young pines in spring and to use them in cooking or to make "pine syrup", very useful to soothe the cough when you got a cold (it can be added in teas or ice-cream as flavoring element with pleasant and powerful pine resin scent). Put in a glass jar small green pines and shoots (better and tasty when picking younger, tiny, green, somehow difficult to pick). Cover completely with sugar, let the mix in full sun for one and a half months. Filter the melted syrup and keep it in a dark bottle away from the light. If you can not wait so long time you can simmer the mix covered by boiling water, stirring until is evaporated enough water to look like a syrup (perhaps 2-3 hours) - but some therapeutic effects could be destroyed by hot water. Both methods will made a great syrup with extremely taste and smell and will conserve for at least one year. Over the years, as a person who felt in love with the plants of the high mountain meadows long time ago, I transformed few interesting specimens in small bonsai. Around Vancouver, the nurseries offers Mugo Pines propagated by cuttings or grafting, so every time when I chosen my plants, I was careful not to choose a grafted one. Mugo is cold resistant coniferous (it grow in zones 2-8) but when is turned in a bonsai, its roots need to protected against freezing. It has a good root system and if you prune it carefully, the plant will be stabilized few days after re-potting (better to do this in spring). The soil might be fast draining to avoid root rot. During the summer is better to spray the foliage with water (daily if the temperatures are higher than 30 degrees celsius).
" Most varieties of Mountain Pine make nice bonsai" - says Peter Chan in his book "Bonsai - The art of growing and keeping miniature trees" . I wired my Mugo Pines bonsai in September (is recommended to do this in fall or early winter) and perhaps these days will spend some time to remove the wires (better to remove them 4-6 months later) before the new candles start to grow - but this will be another post. What beautiful photos those are. Wouldn't it feel amazing to stand atop one of those mountains?